"Jove Wang's 10-day Big Painting Workshop"
I want to use this opportunity to introduce a very special workshop I will provide in 2019. 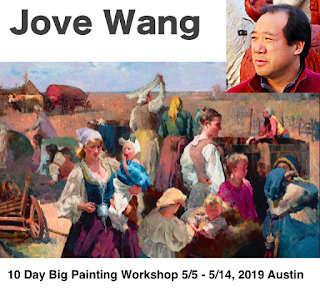 Master artist Jove Wang will come to Austin again next year and teach a 10-day Big Painting workshop. 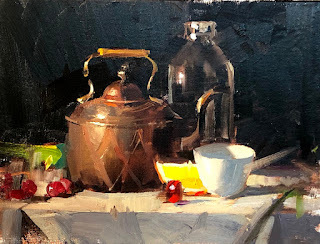 This workshop is designed for advanced artists who want seriously to bring their art to higher level by creating large scale oil paintings. 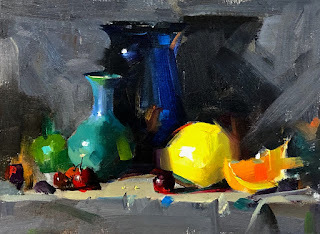 During the 10-day workshop period, students will learn how to develop large format art from multiple reference photographs and preliminary drawings and color sketches. In order to bring the utmost benefit to students, Jove Wang needs to evaluate the skill level of all applicants and provide appropriate recommendations. Please visit Jove Wang 10-day workshop webpage to get more detailed information. Jove and I are looking forward to working with you and helping you to develop your art to a higher level. 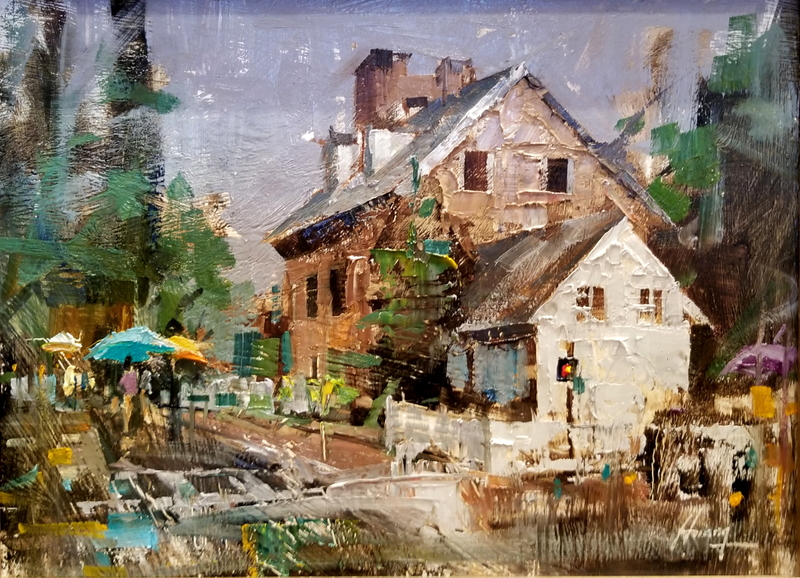 It was an honor to participate the Plein Air Easton competition the 2nd time. This is a painting I did in the rain in down town Easton. I am very happy that this painting has won the 1st place of Quick Draw. 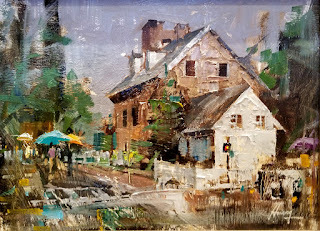 I want to thank Plein Air Easton and the Judge Jill Carver for this honor. I have spent longer time on this demo painting, so I get additional details on the metal pot. I really like the texture. "Demo at Landgrove 2018 1"
Texas has been getting too hot. So I went Vermont. This is 1st demo at Landgrove, VT. 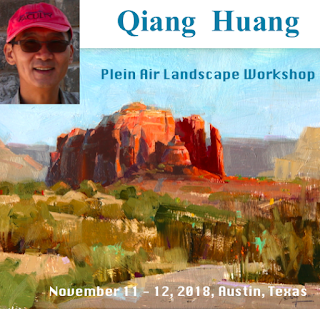 Yes, that red rock is in Sedona AZ, but I like to use it to announce my plein air painting workshop in Austin this fall. Texas summer is brutal. However, November is a good time to go outdoors. I am going to paint the beautiful Texas hill country. I hope you can join me and I will share all I know about plein air landscape painting in this 3-day workshop. Please check: http://www.qh-art.com/qiang-huang-plein-air-workshop-2018.html for detailed info and sign up. Thank you. Nowadays, there are too much going on. We are information overloaded. We are over too busy. I felt I am a machine. Doing one thing after another. I can only react mechanically. In this rat race kind of life, can we still generate good art? I doubt it. I am mindful about it. I know my demos are pretty much the same. It serves its purpose in workshops. My art is still going. I have hope. When I post my painting, I write spontaneously what is in my mind. However recently my mind is blank. I feel I start to have Alzheimer's. So we just let the painting talk visually. This is the third demo I did on my Austin workshop. Life keeps on going. I still have paintings to post. This is my second demo in Austin.